This machine is integral tunnel structure. It’s divided into three parts: preheating zone, heating zone, cooling zone. It adopts hot air laminar flow sterilizing principle to sterilize and depyrogenate containers in short time. When the clean vials are sent to the Sterilizing & Drying Tunnel automatically, they will be sterilized and dried in the airtight tunnel. After the vials are preheated, they will go to the heating zone, the temperature will increased to nearly 320℃(can be adjusted) to do depyrogenation, then the vials will be sent to the cooling zone to be cooled, and then be sent to the Auger Filling & Stoppering Machine. There are 3 sets of shutter manual adjusting device: between preheat zone and sterilizing zone, between sterilizing zone and cooling zone, between cooling zone and filling room. There are medium efficiency filter, high efficiency filter and LAF fan in the preheating zone, which can realize the 100 class LAF. The vials can be preheated by some hot air from the hot zone, then some moisture can be getting rid of. 1 sets of HEPA filter (H14) LAF device at the preheating zone, Dimensions: 370×457×150mm, equipped with 1 LAF fan with separate transducer to control. There are 2 sets of differential pressure detection device in preheat zone: up and down differential pressure of filter, differential pressure between preheat zone and washing room. A temperature probe is equipped at the preheating zone. When the temperature is higher than the upper limit of set point, the tunnel can stop heating automatically to protect the high efficiency filter. There is a view window at the preheating zone, the state of the vials can be seen in the preheating zone. There is HEPA filter, individual electric heating system, high temperature fan, suction fan(to exhaust the humidity air at the front 200mm of the hot zone),and fresh air supplying structure in the heating zone. The vials are depyrogenated in the 100 class LAF with the principle of hot air laminar flow sterilizing. 1 sets of HEPA filter (H13) LAF device at the hot zone, Dimensions: 610×457×150mm，which is equipped with 1 high temperature fan with separate transducer to control, adopts PLC temperature regulator and thermocouple, air flow distribution and control device working properly to ensure the uniformity of the temperature. There are 2 sets differential pressure detection device in sterilizing zone: up and down differential pressure device of filter, differential pressure device between sterilizing zone and washing room. 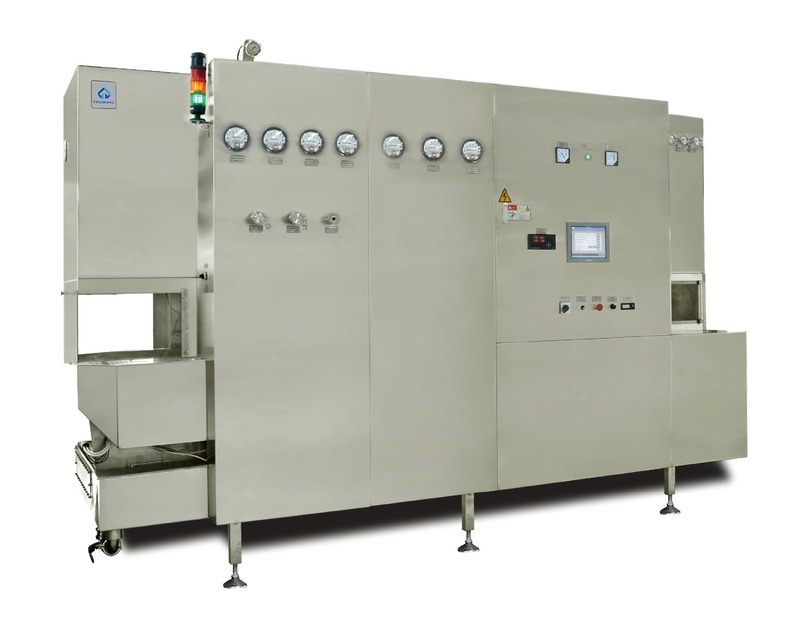 It is equipped with 4 temperature detection sensors in sterilizing zone (one in heating tube area, the others are under high temperature HEPA filter), and detected temperatures under high temperature HEPA filter are sent to PLC for record, and displayed on touch screen. It adopts stainless steel heating tube to heat, and phase shifting pressure regulator to control real-time heating power of electric heating tube, which is controlled through PID in PLC, to achieve temperature control. It adopts new flow distribution technology. There are 3 flow distribution boards between air outlet of high temperature fan and high temperature HEPA filter, to improve uniformity of air supply. It is installed a set of positive pressure chamber under filter for flow distribution to improve heat distribution uniformity. There is an adjustable air return flow distribution board at air return channel to guarantee heat distribution uniformity. Water cooling type is adopted for the cooling of the high temperature fan. It adopts water cooling method to cool bearing holder of high temperature fan. The cooling efficiency has improved greatly. It not only extends the service life of high temperature fan, but also be good for choosing high temperature lubricating grease. Coefficient of thermal expansion for high temperature HEPA filter metal frame and superfine glass fiber high density filter paper are different to avoid filter paper camber in high temperature, it is designed to have clearance in middle and low temperature. This clearance maybe causes leakage, which will affect 100 class LAF effect. This machine increases a divided flow frame, and through the negative pressure principle, divide infiltrated air, guarantees clean security of filtrated air. Temperature control adopts segmented PID technology in sterilizing zone, which separates sterilizing zone into numbers of intervals according to the quantity of high temperature fan. In each interval, there is temperature control probe and detection probe to realize temperature setting and controlling individually, which can guarantee heat distribution uniformity, depyrogenation & sterilization effect. There are temperature alarm system at sterilizing zone, air supply port and heating tube. Once the temperature is higher than limitation at those areas, tunnel will automatically stop heating and stop. Air speed in the cooling zone: 0.45m/s±20％. Medium efficiency filter, high efficiency filter, ventilator and air exhausting fan are put in the cooling zone to realize the 100 class LAF, and the vials are cooled by the air sent from air circulation cooling system with heat exchanger. The air speed difference between the cooling zone and hot zone not only keeps the pressure between them, but also be a necessary jacking to the hot zone to ensure the pressure in the hot zone not to fluctuate much. The cooling zone adopts water cooling method together with surface cooler. It adopts air circulation cooling system with heat exchanger in cooling zone, which cools air through cooling water, and cools vials with cooled air. Cooling air adopts inner circulation method which can highly reduce demand of clean air and mitigate air pressure fluctuation in clean room. Water output volume of surface cooler is automatically adjusted through pneumatic proportion regulation valve according to temperature of circulation air. Adopting this structure, it can avoid condense water at too low temperature, and also prevent overheating caused by too high temperature. 1 HEPA filter (H14) LAF device at the cooling zone, Dimensions: 610×457×150mm, equipped with 1 LAF fan with separate transducer, and an exhausting fan at the down side for inner laminar air flow cycling. There are 2 sets differential pressure detection device in cooling zone: up and down differential pressure device of filter, differential pressure device between cooling zone and washing room. A temperature probe is equipped at the cooling zone. When the temperature is higher than the upper limit of set point, the tunnel can stop heating automatically to protect the high efficiency filter. There is a view window at the cooling zone, the state of the vials can be seen in the cooling zone. It divides tunnel and filling room through SS304 separating board. Flowing direction of LAF in tunnel is from sterilizing zone to preheat zone, from sterilizing zone to cooling zone. Differential pressure distribution is: preheat zone < sterilizing zone > cooling zone. It is equipped with air pressure self-balancing system, which can control air pressure balance between cooling zone and filling room, pre-heating zone and washing, sterilizing room effectively. When the air pressure has fluctuation, it avoids influence to LAF and sterilizing effect. There is pressure monitoring device to detect pressure differential between washing room and filling room and automatically alarm and stop the machine once the pressure differential going too low or too high, which can prevent machine running under over pressure state in order to ensure effective working of air pressure balance system. It adopts our self-made chain mesh belt (made by the CNC net-making machine), with valid width of 400mm. The speed of the conveyor belt can be synchronized with the Washing Machine, Auger Filling & Stoppering Machine. The speed is adjusted by the transducer. Conveying belt adopts integral structure of connecting bottom belt and side belt through chain, and adopts sprocket chain to convey, which guarantees synchronization of bottom belt and side belt. There are several residue removing ports under mesh belt, tunnel and at the outfeed site. It is easy to clean inside of the tunnel. The equipment has a pushing board made of mesh board. It is used at the start and end of the production for supporting the vials and emptying the tunnel. The machine is equipped with DEHS/PAO port for HEPA filters integrity testing, and in non-detection state, it is closed. It is equipped with air velocity detection port, which is installed 3 inches below center of HEPA filter. It is closed in non-detection state. HMI: Proface, 10.4” color screen, the temperature at the heating zone can be set at the HMI, and the temperature curve can be displayed on the HMI of PLC. The temperature can be detected by the thermal couple. The sampling and record interval is 30s (it can also be set by the buyer), the temperature can be kept in the archive for 15 days for check and analysis. Electric cabinet: Together with main machine, airtight. When power fails, the power failure protection function is active. Which flushes the compressed air to the heating zone to cool down the temperature in the heating zone in order to protect the high temperature HEPA (we reserve a port for compressed air, compressed air is supplied by the buyer) . Interlocking device: interlocking with the upstream Washing Machine and downstream Auger Filling & Stoppering Machine to show the cause of fault, position of fault and simple solution. At the same time, it can show the active state of the fan at different zones and conveyor motor. Interlocking with temperature: control circuit has interlocking device. When temperature in the tunnel is lower than 100℃, it can cut off the power automatically. When the temperature is higher than 100℃, all fans cannot stop running, to protect the HEPA filter. It has day mode and night mode. Start day mode while producing. When no production, selecting the night mode. In night mode, electric heating tubes don’t heating and LAF fan run normally, which guarantees 100 Class LAF effect in chamber. It meets aseptic production requirement. It is protected through 3 levels passwords: operator, engineer and administrator. At start and end of production, vials will stay in sterilizing zone for 5 minutes, which guarantees FH value of vials at start and end meeting requirement.